The much awaited annual event – ‘12th Tirupati Book Festival’, organised for nine-days by Bharatiya Vidya Bhavan (BVB) – Tirupati Kendra, began on a grand note with procession of holy scriptures from Mahati auditorium to its venue at S.V. High School grounds. As a part of the tradition followed every year by the organisers, the scriptures such Srimad Bhagavatham, Ramayanam, were taken in a palanquin till the venue, indicating the commencement of the book festival. Deputy Speaker Mandali Buddha Prasad, accompanied by Bharatiya Vidya Bhavan’s Director-Treasurer and Convenor of Tirupati Book Festival N. Satyanarayana Raju, Renowned Scholar Medasani Mohan and other dignitaries, took part in the inaugural ceremony and later went around the book stalls. Inland Waterways Authority of India (IWAI) signed a project agreement with the World Bank, even as the latter entered into a US $ 375 million loan agreement with the Department of Economic Affairs, Ministry of Finance for Jal Marg Vikas Project (JMVP). The signing of the Agreement follows the approval of the Cabinet Committee on Economic Affairs, for the implementation of the US $ 800 million JMVP for capacity augmentation of navigation on National Waterway-1(River Ganga) from Varanasi to Haldia. Out of the remaining amount, US $ 380 million is to be sourced through the Government of India counterpart funds from budgetary allocation and proceeds from the bond issue. Another US $ 45 million will come from private sector participation under the PPP mode. The JMVP, which is expected to be completed by March, 2023, is being implemented with the financial and technical support of the World Bank. The project will enable commercial navigation of vessels with the capacity of 1500-2,000 tons on NW-I. The United Arab Emiratesmade a record by opening the world’s longest zip line, measuring 83 kmin length. 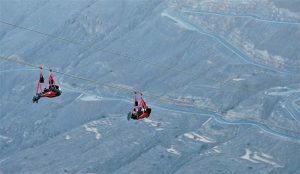 Guinness World Records officials certified the zip line in Ras al-Khaimah. The Jebel Jais Flight takes thrill-seekers atop the country’s largest mountain peak, from a launch pad 1,680 meters (5,512 feet) above sea level. Luger Shiva Keshavan and cross-country skier Jagdish Singh will represent India at the PyeongChang Winter Olympicswhich begins on February 9. Thirty-six-year-old Keshavan, the country’s best known Winter Olympian, will be taking part in his sixth Games since his debut at Nagano in Japan in 1998. Meanwhile, this will be Jagdish Singh’s maiden Winter Games appearance. Schools in Tamil Nadu, Andhra Pradesh, Maharashtra and Rajasthanwill have QR codes in their textbooks, enabling students to view video tutorial and customized content from smartphones, informed. As part of the initiative, textbooks will have digital links with a QR code printed at the lesson and this code will have digital material related to the particular concept, which could be a short video lecture or a tutorial or a customized content. Sharing his experiences of working with the government, Nandan said that one of things that he learnt is that government is a big amplifier. “If intervention happens at an early stage, impact will be bigger. The government is currently spending Rs 18,000 crore on education. At the other end, philanthropic capital is also being funded in the sector. The Environment Ministry has made it mandatory for companies seeking environment clearance to ensure that they put in place a dust mitigation plan. The requirements, specified in a gazette notification on January 25, say that roads leading to or at construction sites must be paved and black-topped. There could be no soil excavation without adequate dust mitigation measures in place. No loose soil, sand, construction waste could be left uncovered. A water sprinkling system was mandatory, and the measures taken should be prominently displayed at the construction site. Moreover, the grinding and cutting of building materials in open area were prohibited and no uncovered vehicles carrying construction material and waste would be permitted. The standards were developed by the Central Pollution Control Board as part of the National Ambient Air Quality Standards (NAAQS), and will now empower the organisation to fine companies and agencies for not complying with norms. Road dust contributed 56% of all PM10 pollution, while it was 38% for PM2.5. Before PM2.5 became the focus of attention — for its role in lodging itself in the lungs and for being a key component of diesel emissions — dust was the key villain for a long time. Dust is a generic term for a vast mix of metals and non-metals — silicon, aluminium, titanium, manganese, copper, barium, antimony, selenium and zinc. 5: fine inhalable particles, with diameters that are generally 2.5 micrometers and smaller. The average human hair is about 70 micrometers in diameter – making it 30 times larger than the largest fine particle.